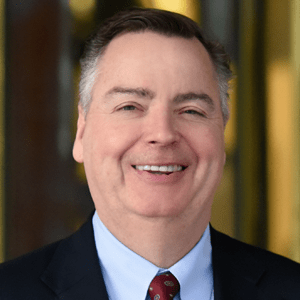 Berkery Noyes Advises Verisys’ Shareholders on the Company’s Growth Investment from Spectrum Equity and Cressey & Company - Berkery, Noyes & Co., LLC. Berkery, Noyes & Co, LLC. 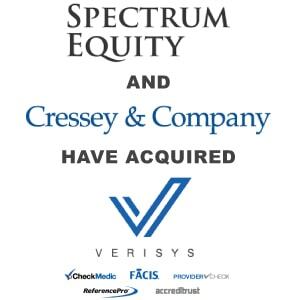 is pleased to announce that it has advised the shareholders of Verisys Corporation, a leading provider of technology solutions and primary-source data on health care professionals and businesses, on the Company’s growth investment from Spectrum Equity and Cressey & Company. The investment positions Verisys, which has long been considered the “gold standard” in healthcare provider compliance and risk management data, to accelerate platform and product investment initiatives, and to continue to execute on a highly successful growth strategy. Verisys’ mission is to serve the healthcare sector with accurate and timely data on persons, professionals and businesses (for contracting, privileging, employment, reimbursement and referral validation). Verisys’ solutions ensure regulatory compliance and prevent healthcare waste, abuse and fraud. Verisys’ products and services include provider data and content, credentialing, primary-source verification services, screening, monitoring and notification services, identity/authentication tied to credentials management and regulatory compliance products and services. Verisys’ flagship product, FACIS®, is the gold standard for exclusion screening in the healthcare field and its SaaS credentialing platform, exclusively endorsed by the American Hospital Association, CheckMedic®, represents a breakthrough in credentialing. Verisys is a NCQA certified and URAC accredited Credentials Verification Organization.